Mint state and key date listed Barber Dime values is for graded, certified and authenticated coins in PCGS or NGC holders. The rest are a sample of raw coin sell but this is not a guarantee your coin with the same date, mint, grade and holder will sell for this exact value. Most Barber Dime dates and mints are numerous and worth just about silver melt, but there’s some rare dates and mints to look for. The 1895-O has the lowest mintage at 440,000 and it’s value begins at $300; the highest mintage goes to 1907 (P) at 22,220,000 and the value begins at $3.00. So mintages do determine a base value but so many have been melted that there’s not much more use for mintage figures. The 1892 might have been the first year of this series but Philadelphia minted 12,120,000 and you can buy it for as low as $3 and some change, but the 1892-O and 1892-S have lower mintages and worth more. So age does not determine value but how many were initially minted and how many have survived today and how many survived in certain grades. Also don’t over-look proof Barber Dimes since they can be found for all dates and for reasonable values since most start at $250. The exception is the ultra rare 1894-S that trades for 2 million or more with only 10 are known but 24 where minted, so you never know when another will be discovered or by whom. Barber Dime value is determined by grade, second to their mintage and survival amounts. Obviously the higher the grade the more they’re worth, but there’s a couple things some collectors over-look or just don’t realize. One, the vast majority of Barber Dimes are common and worth around $3 and many of these are considered well worn “slicks” and they’re often found damaged or cleaned in some way. So condition and grade matters a lot. Second, you might have a common coin that’s common in every grade until AU (About Uncirculated) and that’s when it increases in value dramatically. 1899 is one example that more than doubles in value from EF (Extremely Fine) to AU but the mintage is high at 19,850,000. So don’t look at the date alone but look at date plus mint, and grade, then condition to determine Barber Dime value. 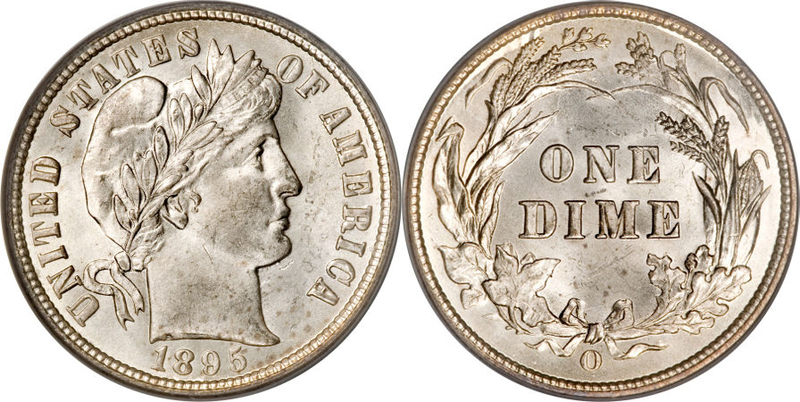 The Barber Dime series is known for many varieties and the most listed and well known is the 1893/2 and the 1905-O Micro O and both are affordable in lower grades, but dramatically increase in value at AU. However there’s several other and lesser known varieties for different dates and mints and these are over-dates, repunched dates, and repunched mint marks. Barber Dime value and how to determine their worth. Barber Quarter Value 1892-1916 - CoinHELP!